I made this doll for my granddaughter Brooklyn, who is due on July 1st. When I was a young girl I loved Raggedy Ann and I still keep a small collection of handmade Raggedy Ann dolls in our guest bedroom piled high on an antique chair. I’ve often daydreamed about how fun it would be to have a granddaughter discover them someday while crawling around and exploring our house. We dream a lot of dreams in our life, dreams about big careers and big paychecks, about exotic vacations and maybe even about movie star boyfriends, as Americans we are taught to dream big. But I think maybe it’s the little dreams that matter the most. The little dreams along with those small everyday wonders that when added together expand our hearts and make us more grateful, more loving people. So maybe give yourself a break today, set aside those big dreams that seem to be a million miles away, and go ahead and dream yourself just one sweet and lovely little dream. See other Wordless Wednesday participants here. This entry was posted in family, my life, spirit and tagged crafts, dreams, family, grandchildren, love, photos, wordless wednesday by Lilli Day aka bookbabie. Bookmark the permalink. Enjoy your new grand daughter. And thanks for the new perspective on the day. She is beautiful. I loved Raggedy Ann as a kid. I can’t remember the last time I saw one. I’m sure your granddaughter will love her. How sweet. I wish I still had mine for my granddaughter. Adorable – I have my raggedy ann (and andy) dolls from when I was a little girl and my sweetie loves them!! This is totally adorable :)! Wish I could do things like that with my hands! That is a beautiful doll. Brooklyn will enjoy it! I especially paid attention to the hands because my daughter was given a rag doll when she was an infant and she used the hands as a pacifier of sorts. The hands on your Raggedy Ann are just like the ones on my daughter’s doll (which she still has but it totally falling apart after much love). Sounds like you will have one lucky granddaughter! I can tell that I am going to have to come back and scour your blog more thoroughly! It is delightful! What a beautiful doll. Your granddaughter will love her. 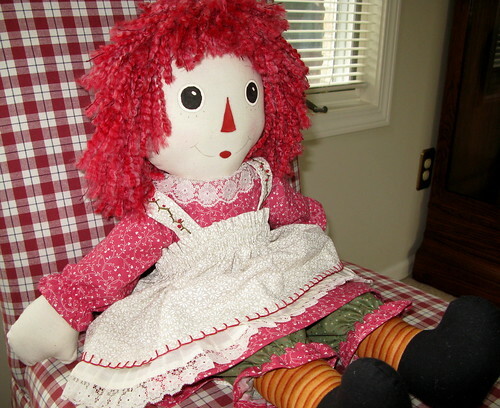 I love Raggedy Ann> I remember mine as a child. This is a simple joy. Oh my gosh, that takes me back. I had a Raggedy Anne and a Raggedy Andy who went everywhere with me. I think my mom has kept them somewhere, I’ll have to ask her. wow, she’s brilliant, love her hair and her pinafore is divine. Hi – How did Brooklyn get her name?? Its very pretty. The doll is great! Lots of love went into her! The doll is amazing and in time she’ll really treasure it knowing you made it for her. I agree, it’s the small dreams that really matter.